Relations between Israel and Sweden have been about as cold as the current weather here, especially since Swedish Foreign Minister Margot Wallstrom opened her piehole. Sure, Swedish opposition lawmakers have shown their disdain for her comments, but there’s no denying Wallstrom’s vile comments have stung. 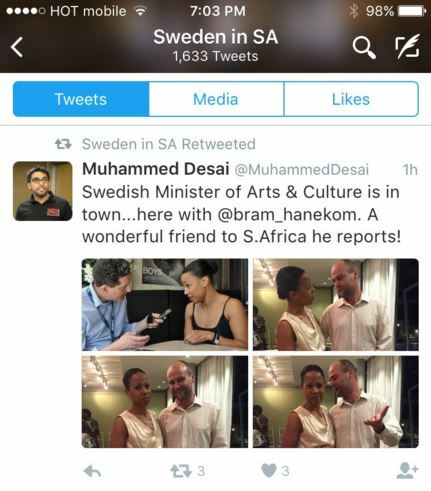 In case you believe she is the one bad meatball in the batch, the official twitter account of the Embassy of Sweden in South Africa has gone ahead and retweeted an infamous BDS-Hole (hat tip: Arsen Ostrovsky). Since this was pointed this out, they have deleted the tweet – but not before Arsen screenshotted it. Here is Muhammed Desai’s Twitter profile, showing his BDSholing ways. But it gets worse than that. He’s justified calls for the shooting of Jews. A leader of the South African Boycott, Divestment and Sanctions (BDS) movement against Israel justified calls to “shoot the Jew” during a protest last Wednesday against a concert by an Israeli musician. Protesters, who gathered at Wits University in Johannesburg last Wednesday in opposition to a performance by jazz saxophonist Daniel Zamir, screamed at concertgoers slogans such as “Israel is apartheid” and “down, down Israel.” Some also threw paper at the Jewish attendees. 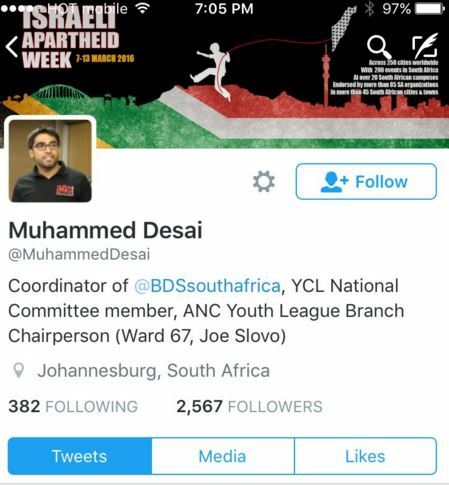 Despite condemnations by both University Vice-Chancellor Adam Habib and the South African Jewish Board of Deputies, BDS coordinator Muhammed Desai defended the call to shoot Jews and told a student newspaper that the word Jews was not meant in a literal fashion. The call to kill Jews was “just like you would say kill the Boer at [a] funeral during the eighties [and] it wasn’t about killing white people, it was used as a way of identifying with the apartheid regime,” Desai told the Wits Vuvuzela.